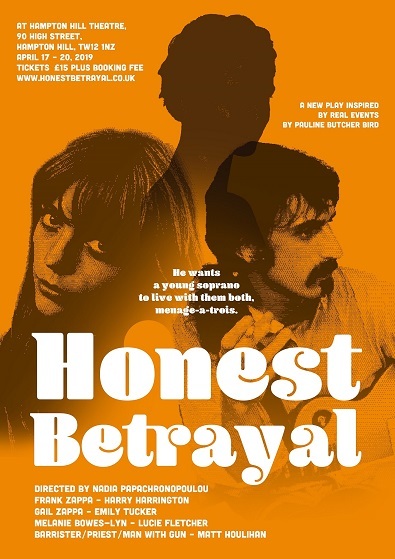 Tickets are now available for a new play written by Frank's former secretary, Pauline Butcher, inspired by Frank and Gail Zappa - at the Hampton Hill Theatre in the UK in April. Interesting - this is bound to raise some hairs, especially if it's good. I wonder how long before Gail died she had been thinking this up. Seems reasonable to assume she wouldn't have done it while she was still alive. Pauline's book, "FREAK OUT! My Life With Frank Zappa" is one of the best books written about Zappa. It was refreshing to read about him as a person, and not as a bunch of facts and muso-criticism. It's a sharp and clear portrait of the '68-'72 era. Zappa was obviously very fond of Pauline, who wasn't another sycophant, starstruck fan, and would speak her mind if she disagreed with him. It's a well written account about the transition from the original Mothers to the Wazoo period. I imagine her script deals with modern boundary crossing, using Frank and Gail as her voice. I wish I could see it! Best of luck to Pauline. I wonder if "Man With Gun" is The Raven. I'd definitely go see it if I had the opportunity. Did they ask FZ’s Hologram to play FZ's part or is he (it or whatever…) already to busy with the "The Bizarre World of Frank Zappa" tour rehearsals? One of the biggest advantages there is to being a hologram is that you can be in many places at once, not to mention needing no sleep. So he could work even hours!!! Holograms should join a union before it's too late. For a moment I was expecting to read "rehearsal" rather than "sleep". what is this about what happened to the 200 motels DVD at Pledge Music. What is going on in 2019 in the Zappa estate. I'm very I'm I can't find the right word. You are quite right, I would not have written the play while Gail was still alive not only because I know she would not have given permission, not that I needed such permission, but still, I would have been unhappy myself to create more tension with her. As it is, I think the play is very sympathetic to Gail. It will be interesting to see if any Zappa fans in the audience - and few are rushing - agree with me. Very amusing. A young, upcoming actor is playing Frank Zappa. I attach a photo of him in his wig and moustache. Well, I would if I could see how to do so!